Way back in 1972, when I was just 18 years old, I was the epitome of health. 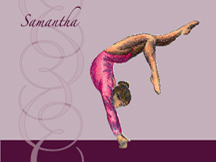 Never got sick, ate the right stuff... and gymnastics reined supreme. I worked for a major insurance company and was digging life in general. On February 4, 1972, the company made it mandatory that ALL employees (over 300 of us) were to report when called (department-by-department) to a station on the 1st floor... and get a flu shot. EVERYONE had to get one. My symptoms began with having the flu. I dragged my maid-of-honor-self down the aisle the following day in my sister's wedding. By Monday morning, I was fine... but throughout the month of February 1972, that same flu would come and go, come and go. Emergency room visits proved futile. "Oh, you have the viral flu... and you're a little anemic. Take a couple of days off work and rest." The next visit: "You have mononeucliosis." 3rd time: "The X-ray revealed that you have no brain tumor, so it has to be mono." And by the 4th visit in mid-March, my toes were numb... and the left side of my face was partially paralyzed, "If you'd just tell us where you were hit in the fight, we might could be able to help you! If not... here's the name of a neurologist...."
Shortly thereafter, I couldn't handle the flourescent lights in the office and had to wear my sunglasses. My boss called me into his office on a Friday and asked to see my arms. He wanted to know if I was taking drugs! "Christine's gotta be on drugs..." was the office buzz. By Monday, I was couch-ridden and my vision was going double. I called out of work. I did the same thing on Tuesday... and received a Western Union telegram: "Due to excessive absenteeism, your employment with the XXXXX Insurance Companies of America has been terminated.
" And along with the termination went my group health insurance. I then collapsed over the coffee table and my father had to carry me to the car and into our family doc's office. "I cannot diagnose this in my office." he told me, and then proceeded to call HIS hospital and I heard him say, "I'm sending a patient via car to Emergency." Back in 1972, GBS was rare... and there was NO treatments available at all. None of the goodies that alleviate progression of the disease. Zilch. None of the resident doctors could diagnose me... but a neurosurgeon could and did. He did a lumbar to finalize the diagnosis... Guillain Barre Syndrome. Intensive care became the site of my own personal battle ground. Before it was all over in there, I went totally paralyzed, watched a sweet Italian woman die looking directly into my eyes while she passed on... and I swore I wasn't going with her so I missed a trache by the skin of my teeth by sheer will power that my lungs would be spared. They were, but barely.